Cape Jervis Lighthouse is a lighthouse located at the headland of Cape Jervis on the most westerly part of the Fleurieu Peninsula, also known as Lands End, on the east coast of Gulf St Vincent in South Australia. It was first lit on 10 August 1871. In 1972, the original tower was replaced by a new tower. Cape Jervis was named by Matthew Flinders after John Jervis, a seaman, rose to become Lord of the Admiralty, 1st Earl of St Vincent on 23 March 1802. Cape Jervis is home to some of the best sea and country views to be found in South Australia with views overlooking Backstairs Passage and Kangaroo Island. Cape Jervis is the jumping off point for daily car and passenger ferry services to Kangaroo Island. It is a 45 minute journey that reveals the spectacular coastline of this part of the Fleurieu Peninsula. The Sealink ferry departs daily for the island. Be sure to stop at the lookout before the ferry terminal and enjoy the panorama. The famous 1,200 km long Heysen Trail starts at Cape Jervis, while Deep Creek and Talisker Conservation Parks are located nearby. Morgan's Beach is a popular fishing and swimming cove and Fishery Beach is as the name suggests, a great fishing spot. Many fishing charter operators base themselves at Cape Jervis, so there is always an opportunity to wet a line. Cape Jervis is on Tourist Route 52 and part of the Fleurieu Way Tourist Drive. This image belongs to the travel and nature stock photo library. 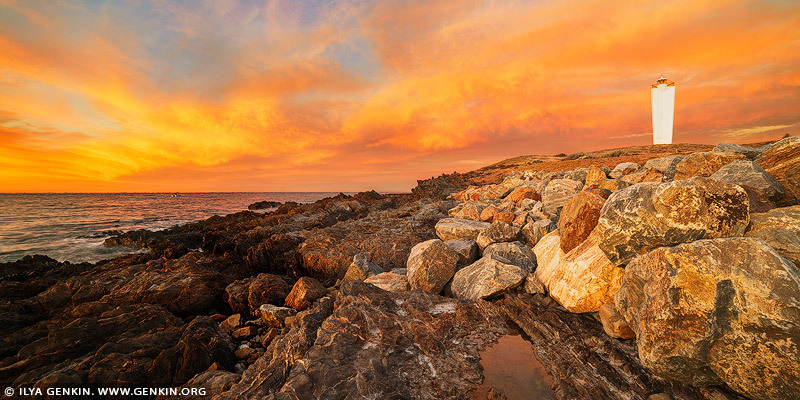 This stock photo of Cape Jervis Lighthouse at Sunset is available for licensing for commercial and editorial uses including websites, blogs, books, magazines, brochures and advertising. Restrictions may apply for images which contain third party copyrighted material or sensitive subjects. Photos of artwork are for editorial use only. This image id AU-CAPE-JERVIS-LIGHTHOUSE-0001 of Cape Jervis Lighthouse at Sunset, is copyrighted © by Ilya Genkin. This is not a public domain image.